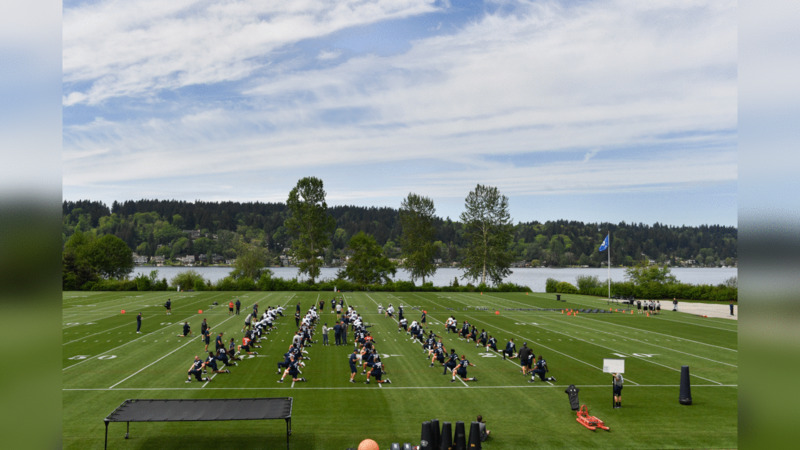 Saturday marked the second day of rookie minicamp for the Seahawks, with this year’s draft picks and undrafted rookie free agent signings joining a group of tryout players and veterans with rookie minicamp eligibility for practice along the shores of Lake Washington. For most rookies in camp this weekend, the experience at an NFL facility, let alone the Seahawks’ headquarters, is a foreign one. But that’s not the case for Will Dissly, who Seattle selected in the fourth round of the 2018 draft out nearby University of Washington. "Really cool to be a part of this organization, just excited to be with the team here,” Dissly said after Saturday’s workout. "Obviously, I’ve been out on this field a few times with the Huskies, but being in a Seahawks uniform it’s an unbelievable experience and just really exciting to keep working with these guys. That Husky connection isn’t Dissly’s only tie to the region, however. The 6-foot-4, 265-pound tight end is also a native of Bozeman, Mont., and his hometown was buzzing at the news that he would be staying in the Pacific Northwest as his NFL career begins. While the Seahawks primarily selected Dissly because they were attracted to his skills as a blocker, on the first day of rookie minicamp it was Dissly's skills as a pass catcher that caught coach Carroll's eye. On Friday, Dissly was one of three Seattle draft picks to sign their first NFL contract, and while Dissly said a pair of new golf clubs may be in his future as a result, it’s his love for the game that motivates him most.